Want to see if your phone number is searchable? Check your privacy settings. A mobile developer has reportedly been using Facebook's Graph Search to scrape millions of phone numbers from the site, but his find is not exactly a major revelation. Dallas-based developer Brandon Copley told TechCrunch that the more than 2.5 million phone numbers he found on Facebook are all publicly available--as in, users didn't change their privacy settings to omit their phone numbers in searches. Copley used his developer account to search for phone numbers; Facebook took notice and told him to cut it out. Copley said he reported his searches to Facebook because he considers the ability to find phone numbers a security flaw, but the social network said the phone number search is not a bug. Now Facebook's lawyers are telling Copley that he's in trouble for scraping data from the site without permission. Copley considers himself something of a white hat trying to help users protect their information. But while Graph Search adds another layer of intrigue to Facebook's ever-evolving privacy settings, the information you share is still under your control. Facebook in January rolled out an early version of Graph Search, which makes the data you give the social network searchable. The thing about Graph Search is that now you're able to find people using the information they make public--pages they've liked, where they live, where they work, you name it. If your privacy settings are off, people can find you. This is not news. This is not a case of Facebook offering up your information on a veritable platter of privacy violations. Facebook last week admitted to exposing phone numbers and email addresses of millions of users. That's a security flaw. This is not. 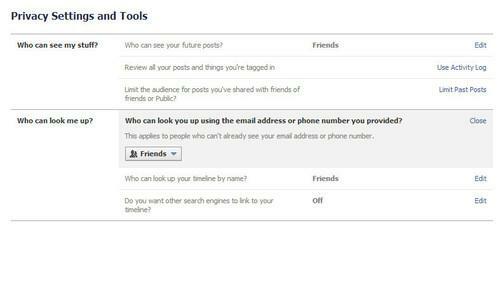 There's even a section in your Privacy Settings called, "Who can look me up?" You can choose whether the whole world can find you by searching for your email address and phone number, or if that privilege is limited to friends (or friends of friends). Facebook's settings can be confusing, but if you care about your privacy, you'll have to wade through them to make sure your information is under lock and key--or at least as much as it possibly can be on the Internet.